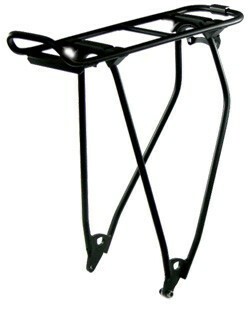 The Racktime Standit rear rack can haul a lot but won't weigh you down. The Standitis versatile and functions well for bike commuting, running errands, or short touring trips. The Standit weighs a mere 1 lb. 6 oz., but it can carry loads of 30 kg. or 66 lbs. 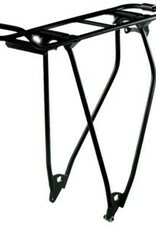 The Standit also has a very minimal profile and design, which gives it a sleek, elegant look when mounted on your bike. The Standit is compatible with both 26" and 700c bike wheels, and it is available in both silver and black. The Standit works with all Racktime products and components that utilize the SnapIt mounting system, as well as most standard rear panniers. Weight: 625g / 1 lb 6ozs.